Julia was working on some lovely little elephants they are so cute, all in various stages, I love the little row of legs all waiting to be stitched on. 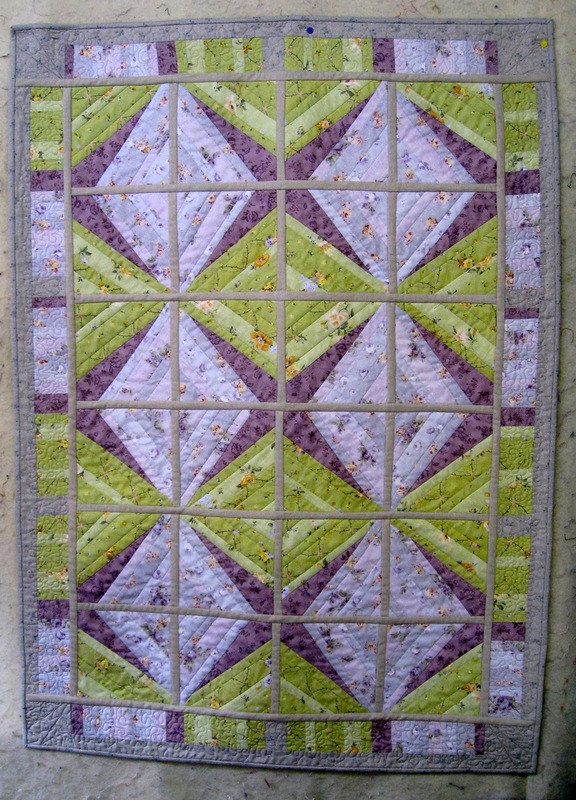 The rest of us were all working on quilts, stitchery, or appliqué, much laughter was had as Maggie had brought in a cake with a slice missing, she said it looked so good on the plate in the kitchen the night before she just had to have a bit for her supper. Well thats another job done and I have very little of the ugly fat 1/4 left, not that I thought it was that ugly, but Ann who donated it thought it was. I do hope they sell at the church sale and brighten up someones kitchen. Sitting quietly sewing away at my stitchery panels, when almighty squawking could be heard, on investigating one very angry Mrs blackbird was telling a rather large pigeon off for emptying the bird bath. She kept on till he rather reluctantly got out. It was fun to watch and I did refill the bird bath for her. 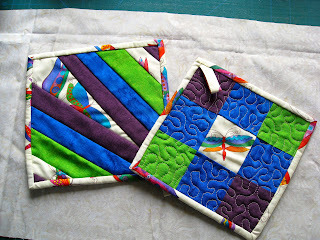 I managed to use some of my fabric from the ugly fat 1/4 swap and made two pot holders but do not feel as if I have stretched my self very much, so intend to make a couple more. keep safe and do lots of stitching. Well it was high time I started on the garden, and now at least I can see the gate to the back garden where the washing gets hung and my little summer house sits, I call it my shed, my husband calls it the summerhouse. I sit in my shed and do my hand sewing, no phone no nothing in fact just me and my stitchery. I finished drawing the stitchery for the new quilt and have transferred it to my lovely essex linen, and now to do the stitchery. Here is a sneeky little peek at the new work. Lots of stitching to be done. It was time for the lovely Jenny's anual garden party, this year however we were all inside her lovely garden room as the weather was not behaving and just after this picture was taken the heavens opened. This year we had to bring our ugliest fat quarter of fabric, wrapped in plain white paper they were numbered and we each picked a secret number out of the pot. Now we have to make two pot holders, one for Maggie in aid of her church and one for Jenny for her mission stall, we can add 3 other fabrics from our stash thank goodness, though I quite liked the fabric I received. It will be interesting to see what people come up with. This was the fabric I received together with 3 fabrics from my stash. Well I thought it was time I sorted out the path to the back garden, yes I can just see the gate and I need to hang some laundry out, perhaps not, urgent need to go to Bungay for some embroidery thread. Did squeeze through though and hang the towels out, figured that was enough for one day,sewing more important. Rainbow over Sunny Cottage there must be Leprechauns in our back garden..
What made us laugh at the quilting Bee ? We had such fun at the Bee yesterday much laughter as always and of course stitching, several of us are working on the Lynette Anderson mystery Fernhill button club BOM, I am just about keeping up to date. The highlight of day was the lovely Jenny modelling her Olympic outfit. 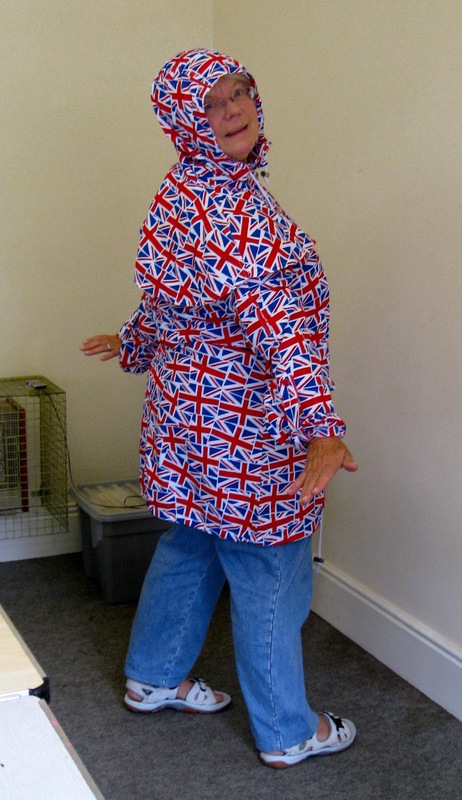 For me Karin from Quilters Haven bought another of my designs can't show you a picture yet as it's a secret and of course it belongs to her now, so all in all it was a good day. Today I went back to the gym after having 3 weeks off, my gym instructor has had a baby a 10 pound 11 ounce little girl, well not so little really. My youngest son weighed in at 10 pound 10 ounces so I know how she feels. 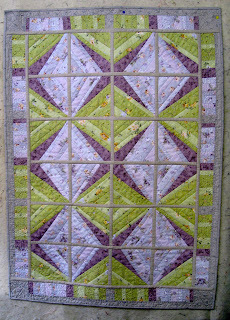 I made this little quilt for her we knew it was going to be a girl but I had no girly pink in my stash, as I am not a girly pink sort of girl, so it's lilac and green I was quite pleased with it and Jo was delighted. Not at the gym tomorrow thank goodness off to the Bee Hive for a hand quilting day with my friends, but I reckon I will be stiff after this mornings exercise.